I have a deep affection for the lower Sac, but I have to say that since I live part of my year in Oregon, I have found that I truly like fishing the Deschutes from Warm Springs to Trout Creek; that is the one day float, floating past the Indian reservation on the left bank; sighting ospreys and eagles, down the beginning of the Deschutes River canyon with towering rock formations and the quiet; interrupted by the rafters, other guide boats and the wandering bank fishermen. Our guide was Brian Yates (541)923-8550, has his own outfitter's license. (no middle man) I have used him almost exclusively for the past few years. He serves a wicked hot lunch of teryaki chicken or steak (you make the choice). Stopping places like 'Frog Springs', 'Big' and 'Little Indian', the 'Kauffman House', plus numerous other picturesque spots. Our first trip was in May. We expected to hit the salmon fly hatch, but were told we were early by a couple of weeks. Nothing on the surface, no birds working and clouds everywhere. It rained while we were lunching under a river alder; Brrrrr .... that rain was cold with a wind blowing right in our faces, right up the canyon. Even adding clothes didn't really warm us up. One thing good was that my mends were perfect (wind aided). We were off the water earlier than usual. We did manage to catch a few trout and of course a few whitefish (they don't fight as well as the trout, but...they are indigenous to all western rivers. Besides they taste pretty good baked. When we got back to Madras (we leave our car at the Safeway lot), I noticed as we topped the hill coming back into town that everything looked white. It had hailed and had we had three or four inches of ice pellets over everything, including the car. More interesting was when we pulled into 'Black Bear' for dinner, our car was the only one melting. It had only hailed on the north end of town. off of indicators with large flies (pheasant tails size 8, then dropping to a size 16 or 18 'Copper John' or some unknown nymph in various colors. 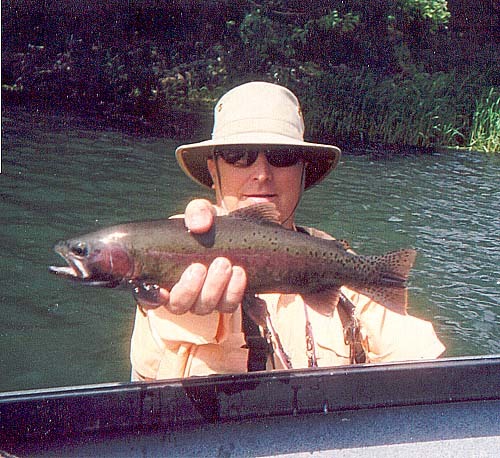 It was a fair day with a few 'redbands' in the 12-16 inch size; a few whitefish as usual and other trout. stronger tippet and a new fly.line, I flipped out again. I was ready when it took. A few mintues later I landed a 16 inch 'bull trout', the first I had ever seen outside the Metolius River. They are really an ugly fish, but a fierce fighter. Releasing it back into the current and with a new fly on another cast. The take this time was a beautiful 'redband' rainbow, a real leeper. As suddenly as it began it stopped. The bugs were still around but the fish were down so we moved on down river, but for thirty minutes it was heaven on earth.